Presented here, a fine Redware Piggy Bank, most likely from Pennsylvania and a wonderful example of the art of the potter. Many banks, especially figural ones, were not production items but were made especially as gifts for children, usually by special order or at particular times of the year, like Christmas. Coin banks took the shape of familiar objects houses, birds, beehives, jugs, and in this case a pig. It seems a shame that the bank had to be smashed to free the slowly acquired contents. In the early days few coins came a child's way, for money was scarce so a bank was the perfect place to store those precious copper pennies. 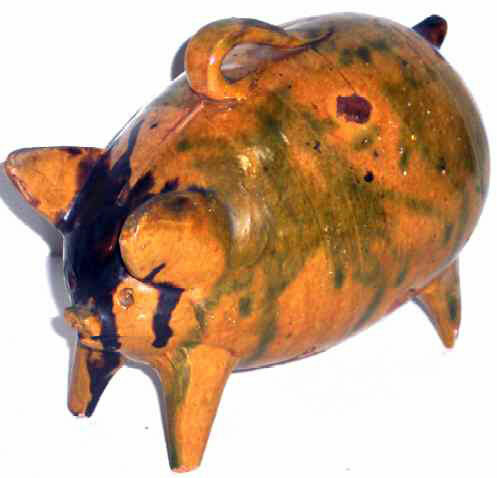 This particular Piggy Bank is a cut above what is usually found in that the potter utilized copper oxide (green) and manganese (brown) to decorate the body of the bank. The little Piggy, who has miraculously survived the fate of some of the others is in overall fine condition with only knick on his rear left leg and bits of loss to the glaze (mostly on the underside of the belly) due to age and usage. There are also a couple of "kiln kisses" where the bank must have touched another piece in the kiln and some extra clay was deposited on the surface. Since Redware was fired at a relatively low temperature compared to other ceramics, imperfections are commonly found. We aren't talking Limoge here folks! The kiln, however, has been generally kind to this one and it is a wonderful and whimsical example of the Folk Art of the potter. Unlike most other Piggy Banks we see, this one is a fanciful interpretation that reminds me of the "Boss Hog" not a little pigglet! He has an imposing presence that would make a charming addition to any bank or Redware collection. Size is 7" long and 6" high at the handle.